For loading or unloading trailers etc. from facilities WITHOUT LOADING DOCKS the UNI-FLEX Trailer Loader is the perfect solution. 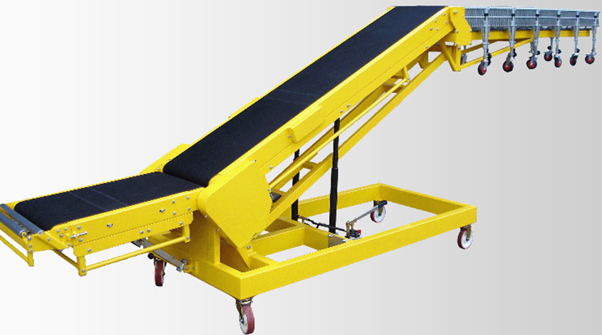 The UNI-FLEX™ Trailer Loader features an inclined belt conveyor, which includes a powered expandable flexible conveyor mounted to a heavy duty self levelling tongue arrangement. 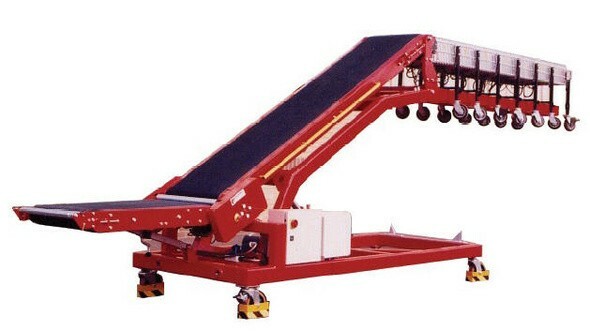 The conveyor is then simply extended into the trailer for easy loading and unloading of parcels, packages, totes etc. Our options include either a fully powered roller extending tongue, a gravity skate wheel or a gravity roller extending tongue if required. Easy hydraulic height adjustment via an on-board electrical power pack for both the auxiliary belt boom and main belt boom, which provides the exact load and unload level required. The UNI-FLEX™ Trailer Loader has a maximum trailer penetration of 8750mm making it ideal for loading and unloading both 20 ft and 40 ft trailers and shipping containers. The unit is easily manoeuvred on heavy duty large diameter robust swivel castors to enable easy location on multi-door applications. Easy to manoeuvre for multi-door applications. Option of fully powered extendible power roller tongue, gravity skatewheel or gravity roller extending tongue. Can be easily connected to UNI-FLEX™ flexible expandable conveyors for continuous material flow. Belt material: Two ply – grip top profile. Endless vulcanised. Chassis Construction: Heavy gauge RHS channel fabricated design..
Castors: 200mm dia – heavy duty swivel. Forward/Reverse/Stop: Controls located at each end of auxiliary and main belt booms.